Hosts Manager is a free program for the Microsoft Windows operating system that allows you to switch between different hosts files effortlessly. The hosts file is a local file in Windows and other operating systems that contains directives to map specific hosts to IP addresses which are prioritized over other means of DNS lookups such as by querying DNS servers. Quite a few applications exist for using hosts files; this includes blocking advertisement and other malicious domains from the computer system or for web design purposes. The latter can for instance be very helpful during domain transfers. It usually takes between 24-48 hours before all DNS servers pick up the new IP address of a web server or website. This could mean that the webmaster who initiated the transfer is still redirected to the old IP with the old website content that are usually locked at this point. An entry in the hosts file ensures that the website is opened using the new IP making it possible to work with it there to ensure that it displays properly in that location (read Work On Websites Before DNS Propagation for an in depth article about that). There are several other web design related tasks that make the hosts file valuable to the web designer and webmaster. It can for instance be helpful when a web designer works on a website that is referencing external scripts which can be redirected to localhost for testing (or avoiding timeouts). Hosts Manager is an Open Source program that can be used to work with multiple host files on a computer system. This gives the user of the system better control over the process. It is for instance possible to create one hosts file for local web design purposes and one for Internet use. 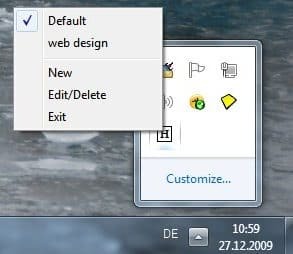 Hosts Manager displays an icon in the Windows system tray upon startup that can be used to switch, create, edit and delete hosts files. Creating a new hosts file or editing an existing one will open that file in the default text editor of the system. All newly created files contain all entries of the default hosts file by default which can be edited in the text editor easily. You may also create new hosts files in the program's folder, as they get picked up automatically as well by Hosts Manager. You can switch between all hosts files that are available with two clicks. Hosts Manager requires the Microsoft .net Framework 3.5. It will run on most Windows operating systems including Windows 7 and Windows Vista. The download is available at the project's homepage over at Source Forge.